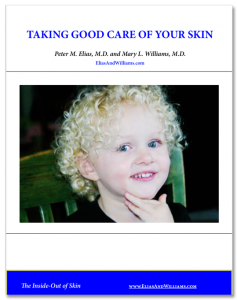 How The Skin Barrier Works - Elias and Williams: The Inside-Out of Skin by dermatologists and skin researchers Peter M. Elias, M.D. and Mary L. Williams, M.D. The outermost layers of skin, the stratum corneum, is like a brick wall. 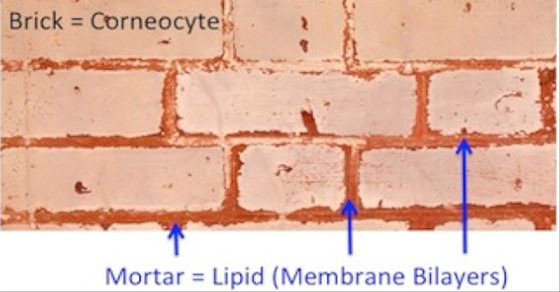 The cells, or ‘corneocytes,’ which no longer contain nuclei and are considered dead, are the ‘bricks.’ They are surrounded by membrane sheets composed of lipids (fats). The fibrous protein-filled cells impart mechanical strength, while the lipids prevent water movement across the stratum corneum. To understand how the skin barrier works, we need to return to our ‘bricks and mortar’ model of the outermost layers of the epidermis, the ‘stratum corneum.’ In this layer, the cells (called ‘corneocytes’) no longer possess a nucleus – they are essentially dead. But they are filled with tough, fibrous proteins, called ‘keratins,’ and many small molecules derived from the breakdown of proteins and other components of these once-living cells. Simply stated, the bricks (or corneocytes) provide a durable defense against the ordinary frictional wear and tear of life. As long, protein polymers, it is the keratins that give the skin much of its remarkable mechanical strength. Another contributor to its strength is another protein structure, the so-called ‘cornified envelope.’ This polymer is made up of several different protein precursors. It surrounds the corneocyte, rather like a hedgerow of rose bushes, and replaces the cell membrane of the former, living cell. To learn more about the skin barrier, sign up to receive our free booklet, ‘A Primer On The Skin Barrier’. In addition to providing for most of the mechanical strength of the tissue, the cornified envelope provides a stabilizing scaffold for the mortar. Recall that the mortar is made up of fats or lipids that are organized into broad sheets or ‘membranes.’ Stacks of these membranes (the ‘lamellar membranes’) fill the spaces between the corneocytes; they are the ‘mortar.’ Thus, the bricks are made of fibrous proteins and the mortar is comprised mainly of fats, organized into lamellar membranes . We know that the bricks or corneocytes are needed as a scaffold for the mortar or lamellar membranes, because in some types of ichthyosis (a family of inherited skin disorders), a genetic defect results in faulty formation of the corneocyte envelope. Because the fibrous wall of the ‘cornified envelope’ is malformed, the lamellar membranes become disorganized, and as a result, the barrier becomes leaky. Thus, the corneocytes literally play a supporting role for the permeability barrier. The lipids (fats) of the lamellar membranes are the principal players; they are the workhorses of the skin barrier. Because these lipids are charged with preventing loss of our precious body water, it is not surprising that they are in fact unusually water-resistant or ‘hydrophobic.’ They are a mixture of ceramides, cholesterol, and free fatty acids. The very long carbon chains on several of these lipid molecules make them especially water-unfriendly. One particularly critical member of this lipid mixture is the essential fatty acid, linoleic acid. It is ‘essential’ because it cannot be made in our bodies, and must therefore, be acquired from the diet. Vegetable oils, such as corn, sunflower or safflower oil, are a good source of linoleic acid. You can think of linoleic acid as a sort of vitamin that is required for the formation and stabilization of the lamellar membranes. When present in insufficient quantities, as in essential fatty acid deficiency, the lamellar membranes become poorly organized and the mortar becomes leaky. The lipids that form the lamellar membranes of the mortar are so water-repellent, that not only do they hold our body water inside, but they also allow us to loll for hours in bathtubs and to swim at will, without drowning though our skin. Still other ingredients in the mortar combat infections. These include both the free fatty acids and several proteins, called ‘antimicrobial peptides.’ These fatty acids and peptides are part of the ‘innate immune system’ – the part of our immune system that represents the first line of defense to ward off infections. This remarkable tissue, the stratum corneum, with its bricks and mortar arrangement of tough fibrous proteins surrounded by water-repellent lipids, provides for many of the defensive functions of the skin, including the one most critical for life on land, the permeability barrier.